Regarded as a leading exponent in the field of new music, Halcyon presents exemplary programmes and stunning performances of vocal chamber music from around the world, with a special emphasis on Australian composition. Co-founded by soprano Alison Morgan and mezzo soprano Jenny Duck-Chong and now directed by Jenny, since its inception Halcyon has showcased many rarely heard international works and premiered new offerings from some of Australia’s most esteemed composers. Since 1998 these ‘new music champions’ have performed on both large and intimate stages, in grand houses, art galleries, recital halls, at music industry events and music festivals, collaborating with numerous outstanding artists and ensembles and forging connections across the globe with composers, music centres and institutions. Bringing the global into conversation with the local has seen Halcyon performing significant international works - George Benjamin, Harrison Birtwistle, Gavin Bryars, Unsuk Chin, George Crumb, Jonathan Harvey, Earl Kim, James Macmillan, Elisabeth Lutyens, Kaija Saariaho, Esa-Pekka Salonen, Somei Satoh, Joseph Schwantner, Chinary Ung and Trevor Wishart - alongside a diverse array of Australiasian work - including commissions by over 30 composers such as Nigel Butterley, Andrew Ford, Elliott Gyger, Moya Henderson, Gordon Kerry, Rosalind Page, Andrew Schultz, Larry Sitsky and Gillian Whitehead. Memorable performance highlights include: Halcyon’s very first performance with Sydney Alpha Ensemble, Antony Walker and school student Jane Sheldon (1998) featuring Crumb, Delage, Ravel and Berio; several collaborative performances of Steve Reich’s Tehillim, Vivier’s Bouchara and LIgeti’s Sippál, Dobbál, Nádihegedüvel alongside new music powerhouses Synergy Percussion and Ensemble Offspring to an enthusiastic audience of over a thousand (2007); many performances with longstanding offshoot ensemble Sirens including premieres of works by Graham Hair and Dan Walker, the inaugural Aurora Festival (2006) - which featured the premiere of Elliott Gyger’s From the Hungry Waiting Country, a fiendishly virtuosic piece uniquely crafted to the performers - and a semi-open air performance of Gillian Whitehead’s Nga Haerenga at NIDA (2013) with percussionist Claire Edwardes and narrator Tony Llewellyn-Jones; repeat performances of Nigel Butterley’s epic song cycle Orphei Mysteria, commissioned in 2008; and the seminal Kingfisher: Songs for Halcyon project (2013-14), which saw the commissioning and presentation of new works of vocal chamber music gifted by 21 composers. Beyond the concert stage, Halcyon has been active as a mentor for young artists, composers and ensembles. For almost ten years they have presented concerts and workshops focusing on vocal writing and contemporary Australian song repertoire to composition and vocal students at secondary and tertiary institutions in Sydney, Melbourne and Canberra and have been guest artists and mentors for younger ensembles, assisting in the creation of many more new works for voice and instruments. 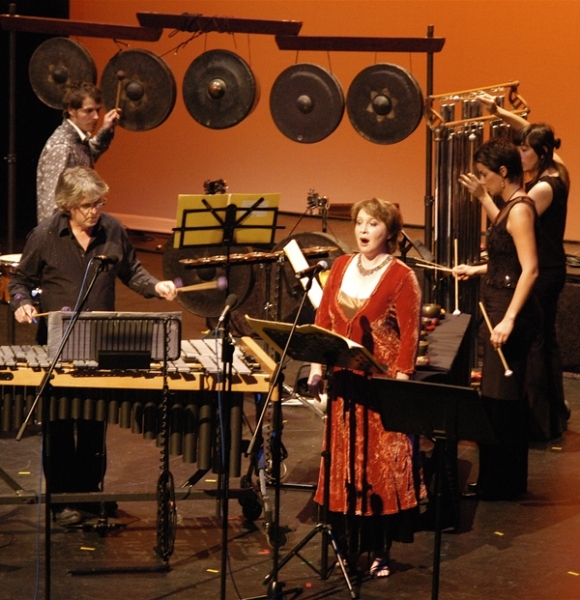 In 2011, Halcyon launched its inaugural emerging composer’s project, First Stones, with the assistance of composer mentor Elliott Gyger. Over a six month period, featuring a weekend seminar, a week long workshop, individual mentoring and final rehearsals, it culminated in a showcase of nine new works at Sydney Conservatorium. Halcyon’s expertise in this area has led to invitations to present seminars and run workshops at Melbourne and Sydney Conservatoriums and at Australian Society for Music Education (ASME NSW). Since 2006, Halcyon has also produced an extensive series of studio recordings showcasing Australian composers and commissions, to make this intimate music accessible to a wider audience. Their recordings are featured on Move Records, Tall Poppies and Wirripang as well as their own self-released Waves series and includes Kingfisher – Songs for Halcyon (TP236), which features 21 new works commissioned to celebrate 15 years of Halcyon in 2013, (given 4/5* in The Australian review). 2018 marks the 10th anniversary of Halcyon’s first studio project Cool Black, a beautiful disc of Spanish, French and Icelandic inspired song cycles by composer Rosalind Page, and the year will also see the release of three new studio albums to add to this already substantial legacy. We respect your privacy and will not share your email address with any other party. With a career spanning more than 25 years, mezzo soprano Jenny Duck-Chong has established herself as a versatile and intelligent musician with extensive experience in a broad range of classical repertoire. She has worked with Sydney's finest vocal ensembles, including Opera Australia, Pinchgut Opera, The Song Company and Cantillation. Renowned for her dramatic portrayals of tragic heroines, such as Purcell’s Dido, Monteverdi’s Arianna and Britten’s Phaedra, as well as her formidable performances of contemporary works such as Ligeti’s Síppal, Dobbal, Nahigedüvel, Macmillan’s Raising Sparks, Benjamin’s Upon Silence and Berio’s Folksongs, she has been a featured soloist with ensembles as varied as the Sydney Symphony Orchestra, Sydney Philharmonia Choirs, Sydney Baroque, Ensemble Offspring, the Renaissance Players and the Kevin Hunt Jazz Trio. She is the director of acclaimed new music ensemble Halcyon, with whom she has been active in commissioning, premiering and performing Australian and international repertoire of the highest calibre for two decades. A passionate advocate of vocal chamber music Jenny has run classes, seminars and workshops for secondary and tertiary students and has built relationships with composers, performers and institutions around the globe. Also an avid recitalist, Jenny has recorded numerous concerts for broadcast by the ABC and 2MBS-FM and in the recording studio, has featured as a soloist for ABC Classics and Walsingham labels as well as in film and TV scores and numerous other recordings with Cantillation, Pinchgut Opera, The Song Company, The Renaissance Players and Halcyon’s own recordings.